Just a quick note – I’ll post a bunch more pics tomorrow. It’s been a fun day, not least because I had a game of Tribes of Legend with Nigel Stillman (and then a bunch of us played Condottiere). For those of you that are not familiar with Nigel, he worked for GW for years, but his gaming credentials go back further by far, to authoring classic WRG publications that every Ancients gamer should know. He is, by inclination and trade, an archaeologist that specialises in the early Bronze Age in the Middle East. He’s also a very entertaining chap. 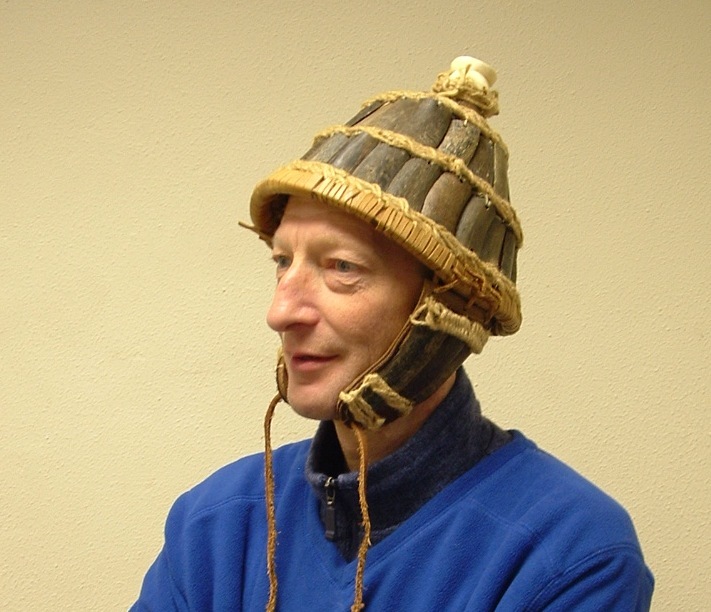 He does, for example, turn up to open days with some of his latest experimental archaology in the form of a horn helmet. Not a horned helmet, mind you, one made from (buffalo) horn, much like the boar tusk helmets you see. Anyway, here’s a photo of him wearing it. A very sturdy piece of kit it is too. I’m a huge ancient middle east buff, and Nigel Stillman had an influence in my teenager years almost as important as yours (you know, White Dwarf and such), so I had to ask. Does he have any website in which he posts the kind of things (or photos) you talked about in this post? However, if I get a chance to show you any more of his cool experiments I will do. its great to see that Nigel is doing well (i like his helmet :)). After he left games workshop i always wonder what he is doing. I love his terrain making book. It is always inspiering me. I have to say i read your blog since the first entry and i realy enjoy it. Please continue your game reviews and keep dwarf kings hold goning on. Thats a realy great game and i enjoy it very much. Nigel’s terrain building is always inspired and inspiring. He has a great knack for throwing things together in a way that is simple to make, but looks great on the tabletop. I forgot to say that i cant wait to get my fingers on the new dwarf kings hold box. Are there any plans to do it in german and also to do the rules for kings of war and warpath in german? It would be great. I’ll ask the chaps when I see them next. You could also email them and ask about translations for DKH, etc yourself. More pressure would encourage them!